Not much noteworthy happening around here. Oh, we did have a little excitement. Paul took my car the other day to do the food shopping and the next day the front right tire was a little flat. He found that he’d run over a screw of some sort. He pumped the tire up (we use a bicycle hand pump!) enough to get him over to the car mechanic’s place in Marblehead where Harold put a plug in my tire. Then it was time for my car’s yearly Safety & Lights Inspection. Paul does this for me, as well. Off he goes to get it inspected the other day and came home with thumbs up… it passed! (My car is a 1999 Honda CR-V and it is almost as house-bound as I am these days… only going out when Paul takes it out to keep the battery from dying). The next morning (which was yesterday), he went out to search some more in the car for the jack. He lost it. 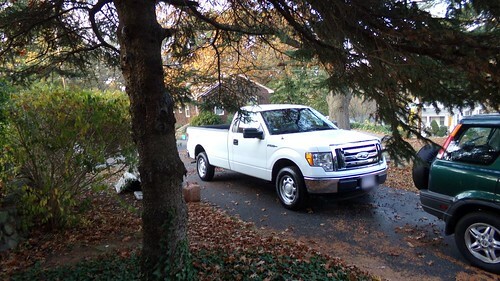 He also thinks he left his old zipper-jack in his old truck when he traded it in recently and got his “new” truck (see below – I call her “Blanche”). It’s 2 years old which is quite “new” for us. My car is 14 years old and Paul’s old truck was 13 years old. I will probably never get another newer car since I don’t drive much. It runs fine. The air-conditioner in it doesn’t blow cold air anymore, though. I asked Paul if his “new” truck came with a jack and he said “I imagine so.” I told him to check it out and make sure he knows where it’s located and how to get to it if he needs it in an emergency. He just brushed me off saying “yeah, yeah…” – typical! Men! So I told him that when he is out on the highway and he gets a flat, not to call ME but to call AAA because I am not coming out there! Didn’t faze him one little bit. 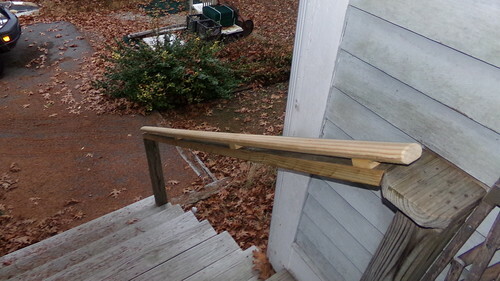 Another little project we (or rather Paul) accomplished was to install a more comfortable handrail going down our side deck stairway. The old one was a flat wide plank and you couldn’t get a good grip on it. Remember, this is the stairway that I fell down and hurt my leg a while back, and if I’d had a good handrail I might not have fallen. It took forever of tossing ideas back and forth before we decided on this design. It’s just a piece of molding wood from Home Depot mounted on the old railing with some little blocks of wood so I can grip it around with my hand. I like it. I feel a lot safer now traveling down over those stairs, which I do once a day when I go down to the post box to get the mail – my big outing for the day. Coming back up is also better now that I have something to grip. It’s the little things like this that make life bearable and workable around here. Blanche is a mighty fine-looking truck! I like the looks of your Honda, too. I doubt I’ll get another car unless I move back to Maine. Really don’t need one here. A bus comes by, just a short walk from my house every 10 minutes from 5 a.m. to midnight. Glad to hear your car passed inspection. Mine comes up for inspection for the first time next year. 😦 I’m not sure how that’s going to go as I hardly ever drive it. Just like you, I pretty much stick close to home. With the car jack, the wrecker yards are a great place to look for a car jack. Just call them and ask around. They often have a catalog of parts so they know what they’ve got. I found a radiator for my old car, two cars back, at one some years ago – and at a really good price. Sorry to hear about the flat tire. It’s always something, isn’t it. I like the new handrail. That does look a lot safer. 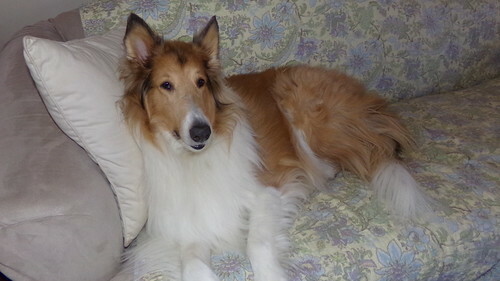 Your dog is pretty, and I’m sure a very good companion. Ah, the joys of vehicle ownership. Michael has a 2003 Mazda truck with just the basic but with air conditioning. There is some computer stuff in it but when he opens the hood there is no way either of us could work on it like we did with our older cars. Miss that I do. I don’t drive much either and unless this truck totally falls apart (thank heavens it has passed all its reviews) I doubt we will get a new car. We don’t drive that much except to doctor appts. and grocery shopping. If it’s here in town, I can walk which I like much better. I have heard too many accident reports on the news lately that it scares me to get out there. Love the new railing. It looks pretty spiffy. My PT just had to have a front tire replaced. Lord knows what I may have driven on. The “new” vehicles nowadays are all run by computers, the more current it is, the worse. If you are not a computer person, like Paul, you don’t want that. I asked him to get the basic truck and he got a 2012. It doesn’t even have a CD player in it, just an AM/FM radio. So he was able to adapt. No GPS, auto-driving, and whatever else the new vehicles have. Pretty soon the driver won’t even have to do the driving, which scares the shite out of me. Always a relief when the car passes inspection. Mine passed a couple weeks ago. Of course I drive it so little about the only way it would fail is because of rust. It’s a year newer than yours, bought used. Never had a new car and there’s no reason at this point, with my small amount of driving, to buy a new one in the future. I suppose my car has a jack in it, but I’d just call AAA.